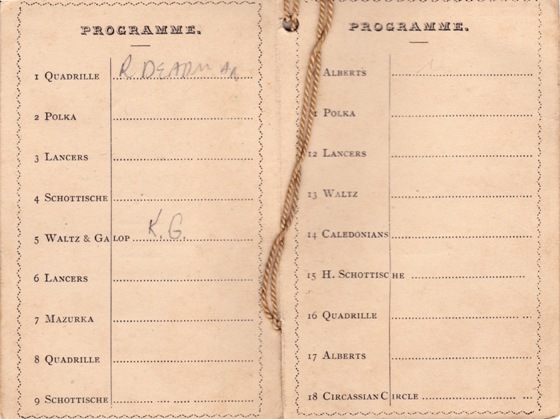 Lemuel Lyes, a collector of things historical and admin of the excellent website History Geek, made an excellent recent purchase of a dance card from what was described back in 1877 as the first County Ball in New Zealand. 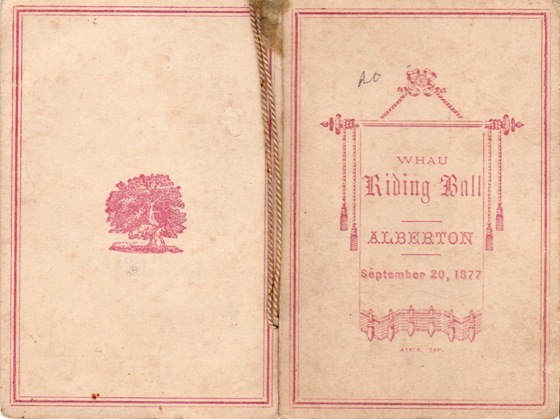 Which actually turned out to be a part-of-the-Eden-County ball, or Riding Ball (the Whau Riding was one of the wards of Eden County). I have yet to find any other "Riding Balls", so this looks to be the one and only example. Thank you, Lemuel, for permission to use these scans. The County System replaced the Provincial Council System at the close of 1876. It took at least nine months for the Whau Riding to get their act together to stage the ball, which may well (as you'll see below) have ended up staged at the Whau Public Hall, instead of (as it turned out) inside a barn on the Alberton estate. 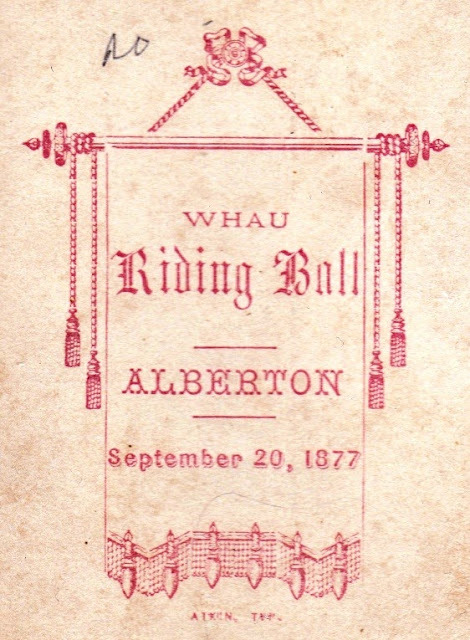 Mr A K Taylor, of Mount Albert, has determined to inaugurate here a custom which, obtains at home, and to give a county ball, or rather in this case a ball to the electors of the Whau Riding of the County of Eden. About 150 electors recorded their votes at the last election, and we understand that invitations have been issued to. each of these, as well as to a number of private. friends of the host. We have no doubt that the ball will be a very successful affair in every respect, and will contribute greatly to the promotion of friendship and good feeling amongst the resident of the Whau riding of the County of Eden. The first county or riding ball in New Zealand was held yesterday evening. It was given by Mr. A. K. Taylor at his estate, Alberton, in the Mount Albert district. The ball has been for a long time expected by the residents. It was to have taken place some time ago, prior to the time Mr. Taylor stood for the General Assembly. It was then arranged for a subsequent period, but in the meantime the Counties Act came into force, and Mr. Taylor was a candidate. Sooner than take a position which might appear to influence the constituents, the ball was put off, with the intention of having it brought on after the County Council election. Another question then arose, and that was with regard to the suspension of the operation of the Act as a whole. This led to a further postponement of the ball, for Mr. Taylor would not have anything to do with an arrangement which might be said to influence votes on public opinion. Subsequently it was intended to hold the ball in the Whau Public Hall but the ratepayers of Mount Albert district and their wives and families had an objection to this, and the consequence was that the ball was deferred till last night. In the meantime, a spacious barn, 60 by 28 feet, had been erected by Mr Taylor close to his residence. It has a splendid floor, and last night the dancers had no reason to complain of it. There are over 400 ratepayers in the Riding, including the Mount Albert, Mount Roskill, Point Chevalier, and Whau Highway Districts, and Mr. Tayior arranged to invite all those who had recorded their votes at the last County election, with their wives and families. About 350 invitations were issued, including of course Mr. Taylor's private friends. The large building was densely crowded, about 250 being present. It is needless to say that they were entertained in the most hospitable manner. The ball was given on the same principle as the county balls of England. Those who know the customs of the old country, will understand with what pleasure those county balls were looked forward to. Mr. Taylor deserves very great credit for being the first to inaugurate this good old custom in New Zealand, and we hope that when the representatives return from their Parliamentary labours they will be stimulated to follow the lead which is now before them. The objects of English county balls are twofold they serve to bring the electors together in a social manner, and make them acquainted with each other, and they make the representative acquainted with his constituents. The ball last night thoroughly bore out these characteristics, except that the M. H. R. was not present. Amongst those present were the host and hostess, Mr. and Mrs. A. K. Taylor, the Misses Taylor, Mr. and Mrs. R. C. Greenwood, Mr., Mrs and Miss Martin, Mr. and Miss Bollard, Mr. and Miss Owen, E. Allen, jun., T. Allen, Mr. and Miss Gladding, Mr. Jos. Greenwood, Mrs. and Miss Greenwood, Mr. Udy, Mr. Jos. May, jun., Mr. and Miss Braithwaite, Mr. J. D. Kelly and Miss Kelly, Mr. Walters, Mr. Paice. Mr., Mrs., and Miss McTavish, Mr. and Miss Edgecombe, Captain Seymour and Miss Seymour, Mr. G. Thomas and Miss Thomas, Mr., Mrs., and Miss Dawson, Mr. and Miss Turk, Messrs. H. and P. Hoffmann, Mr., Mrs., and Miss Smith, Mr., Mrs., and Miss Adams, Mr. and Mrs. Johnston, Mr. and Mrs. James Palmer, Mr. and Mrs. James Archibald, Messrs. J. Campbell, J. Smith, Mr. and Mrs. James Hepburn, Master and Miss Laurie, Mr. and Mrs. Archibald Hepburn, Mr. James and Miss Page, Miss Monaghan, Mrs. Sadgrove, Mr. Henry and Miss Hasell, Mrs. Currie, Mr. Seabrook, Mr. Wright, Mr. Vaughan. Mr. and Mrs. Sansom, Messrs. R. and G. Morrow. Philson, Bain, Smith, Bucholz, Wright, Haultain, Anderson; Mr. J. P. Sinclair, Master and Miss Denyer, Mr. and Miss French, and others whose names we did not know. Mr. Taylor led off the ball with Mrs. Greenwood. The programme was an excellent and varied one. A good band was in attendance. The hall was gaily festooned with flags and evergreens, and the manner in which the enjoyment of the guests of all ages was contributed to, reflects very great credit on the taste and hospitality of the host and hostess. I've boldened some of the Avondale-Waterview names I know of on that list, but there were also folks there from West Auckland (Archibalds, Denyers, Hepburns), Epsom/Royal Oak/Mt Eden (Udy, Greenwoods, Paice, Kellys) and Captain Seymour from Pt Chevalier. As I mentioned -- that seemed to be it for the County of Eden, the elected officials of which met only sporadically, and by the 1890s had pretty much given up the ghost. The City of Auckland would come to dominate the isthmus, rather than the 1876 county. Elsewhere though, county balls didn't happen all that often anyway, and another "riding ball", not at all. The next reference found was in the mid 1880s, down country. Preparations are afoot for holding a grand county ball at Waipukurau on May day. Of course this is for the upper ten. There is to be a fancy dress ball here in the county town on the same evening, which will possibly be much more popular. Stratford having blossomed into a full blown County, is to celebrate the event in about a month's time by holding a grand County Ball, which will be got up regardless of expense, and will entirely eclipse anything of the kind hitherto attempted. It is not yet known definitely whether the Governor will be present or not, but it is expected that most of the elite of the colony will grace the hall with their presence, and that the occasion will long be remembered as the most brilliant event in the history of this world renowned district. There was an Akaroa County Ball, 19 December 1894, but the next ones of note come from the early part of the following century. The event of the month in Warkworth, the County Ball, takes place next Wednesday, the 16th, inst. Judging by the great interest displayed throughout the whole district, and the extraordinary number of acceptances to invitations that have been received by the committee, the ball promises to be a great success. The boast of the committee that it would make the ball "The ball of the North for 1905 is likely to be realised. From information received the fancy costumes will be many and varied. The services of a first class orchestra have been requisitioned from Auckland, and the caterer has received orders not to spare expense in providing supper, which is to be served in, a large marquee. Given a fine night the floor will certainly be crowded by a pleased and brilliant throng. From then on, there seemed to be little point in saying these balls were so that the elected officials could meet and mix with the electors. The following seems to have been one of the last -- and it was definitely a much more exclusive affair. Manukau and Waitemata County Councils held their first annual dance last evening at the Dixieland Cabaret. The chairmen and members of the two County Councils and the Waitemata Electric Power Board were among the large gathering that attended. The ladies' committee was: Miss H. Thomas, in cameo pink net and blue corsage; Miss B. Hanlon, ivory ring velvet; Miss W. Hill, Lido blue frilled georgette; Miss Bennetts, almond green crushed velvet and net; Miss J. Page, geranium red satin. During the evening an exhibition of ballroom dancing was given by Miss Jeanne Horne, and the latest tap dance was rendered by Miss R. Davidson. "I love these written records and cards. The balls were probably way too exclusive for our tastes, but the contemporary information may not be available from other sources. The book "Fromelles", for example, relied on newspaper records like these a number of times. On second thoughts, county balls were probably the highlight of social life in the late decades before WW1 :) "
"Dance cards were already dead when I was a kid. But there were was the alternative, the 'promise' of a dance. I certainly remember the country balls and country dances. What an effort the women put into their appearance. How awful were the men who stood outside the venue and drank beer. Truly awful were the women who organised the supper. They were always older woman who would cast judgement on every attendee. The politics of organising country balls was terrifying. Sorry if I went a bit off topic." A great piece of ephemera.